Conservation landscapes support local wildlife. Observers of conservation landscapes quickly realize our landscapes, our water and our wildlife are connected. Free for CCLC members, Season 6 of our Focus on Sustainability Webinars are now in session. Register for upcoming webinars, or view recording from our webinar archive. Our actions are closely linked to the health of the Chesapeake Bay. Stewardship of the land and water by each and every one of us is our most effective tool to improve and protect the Bay. Conservation landscaping is working with nature to reduce pollution. Conservation-focused landscapes incorporate environmentally-sensitive design, minimize polluted runoff, conserve water and are planted with native plants. They protect the soil and are maintained using the minimum amount of chemicals to help protect clean air and water, support wildlife, and provide a more beautiful, healthier human environment. With so many people living and moving into the Chesapeake region, polluted runoff from streets, farms, construction sites and yards, has become an increasing problem. Contaminants from every home and community—sediments, sewage, manure, fertilizers, pesticides, herbicides and motor oil—can be carried into the Bay from local streams and waterways. How we manage our landscapes is important to all of us! You can embrace the responsibility of caring for the land, and protect the Chesapeake Bay by applying the principles of conservation landscaping. We invite you to explore our web resources, participate in our events, subscribe to our listserve or donate your time or money to support these learning opportunities. Each of us has the opportunity to protect the future health of our communities and Bay by how we envision and care for our landscapes. Hometown Habitat is a 90-minute environmental, education documentary focused on showing how and why native plants are critical to the survival and vitality of local ecosystems. 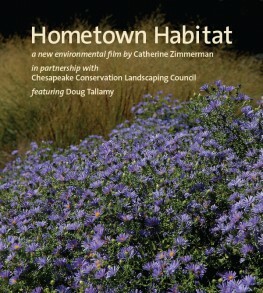 Entomologist, Doug Tallamy, narrates the film as we meet homeowners, ecologists, entomologists and other experts who will share the science behind how low-maintenance, seasonally-dynamic and eco-healthy conservation landscape installations benefit society. Watch the film’s teaser trailer, learn more about the film, follow our progress on social media and donate to help support the film’s progress!